It is very hardly when we need to retain sequence globally. We can use identity property of column but it is limited to that table only. SQL Server 2011 has introduced new feature named "SEQUENCE". We can retain the global sequence and can be used in multiple tables or in any queries. It's really global sequence generator and alternative option of Identity columns. Let's see the simple example using it. 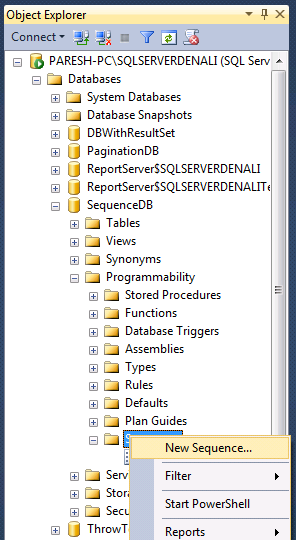 Creating database and table objests. Now we will create a Sequence. Let us insert some records in table using sequence and see the data in table. 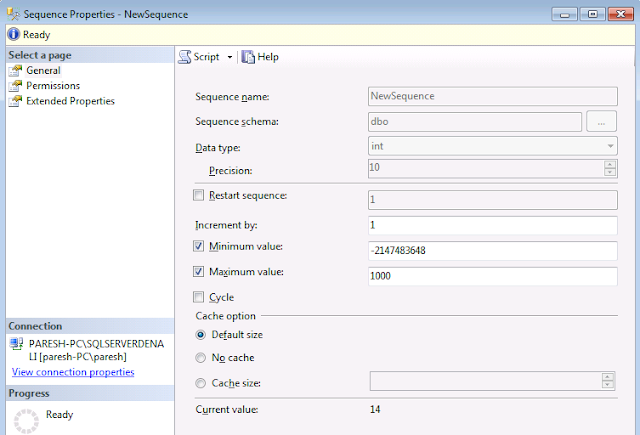 Now we will alter the sequence and reset to 1 and then review the next sequence to be generated. Let's see the next values from sequence from first run. Next values for sequence from second run. 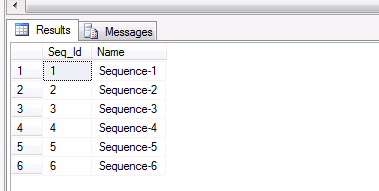 Sequences have been around in Oracle since forever so will probably be a useful addition to SQL Server, but YUCK: "SELECT next value for [NewSequence]"
Oracle's NewSequence.NEXTVAL is a million times better.